I’ve been using the nightly builds of Firefox 4 for a while now, and thought I’d just blog about a few of the nice improvements that have been made. Firefox now lets you connect and sync your bookmarks, passwords, history and settings between different computers. Personally, I have been using the Weave extension to do this for quite a while. Specifically I have synced history and passwords between my home and work computer. Bookmarks I have intentionally kept separate. The especially nice thing is that this works with Firefox Mobile too. And if you have an iPhone, there is the Firefox Home app which loads your Firefox history, bookmarks and tabs for the Safari browser. A new feature for those who have a *lot* of tabs open. With tab sets, you can hit Ctrl+Space and organize your tabs into groups. It is hard to explain in words, so have a look at the video here. 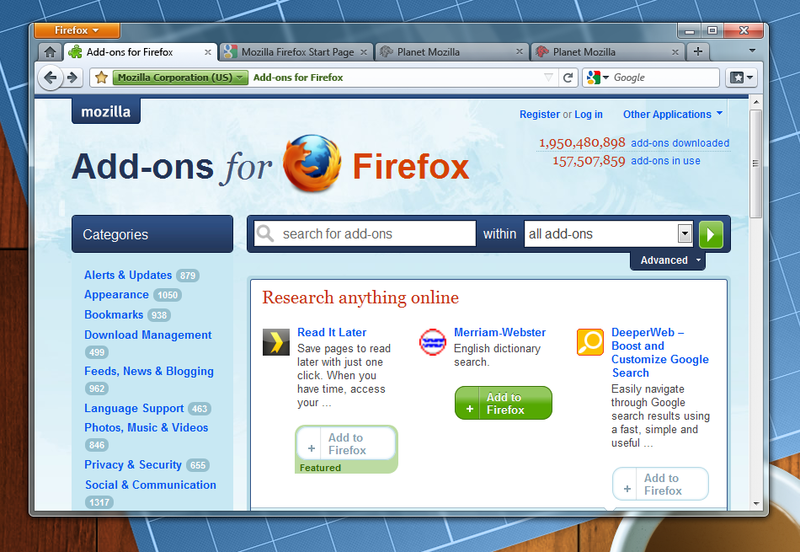 Firefox’s look has been given a complete overhaul. The goal of the new theme is to get out of the user’s way and to leave as much space as possible for the web content. The current betas have parts of the new theme, but not all of it. For anyone using Windows Vista or Windows 7, this will be a welcome update since it fits better in with the operating system. Especially since the new theme supports Aero Glass, i.e. the semi transparent windows in Vista & 7. There are pros and cons to both placements. Having them at the top feels more logical though, since the tab applies to navigation buttons and the location bar. Also, there is screen space to be saved if you push the tabs all the way to the top of the window when maximized. This hasn’t yet been fixed, but it looks like it will be. WebM will probably be the next big thing on the web. Imagine being able to watch video on the web without the hassle of plug-ins? Well, when the web browsers all support a common video format that could become reality. At the moment, Internet Explorer is the only browser not to support WebM. In Firefox 4, you can right-click a tab and make it into an “App tab”. This basically pins the tab over to the left and hides the page title. Useful for tabs that you keep open all the time, such as e-mail or Facebook. Here is a nice video explaining the feature. Apart from the new features that are directly visible to the user, Firefox 4 has loads and loads of improvements in the way it interprets web pages. So when you do upgrade, you’re also making life easier (& more fun!) for every single web developer out there. If you haven’t already, you can get the latest Firefox 4 beta here. Posted at 14:08. Tags: Firefox 4. Categories: browsers, Mozilla Firefox. Both comments and trackbacks are closed. Off topic: What wallpaper did you use for the screenshot above? I think that’s a screenshot from somewhere else, so I don’t know.